I wanted to try using polymer clay to make a bowl. 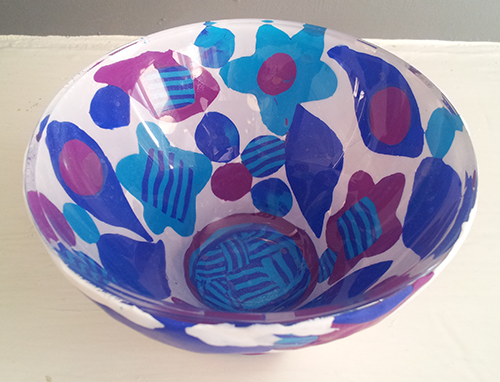 The first step was to find an old glass bowl that was a good size that I could use as a mould. 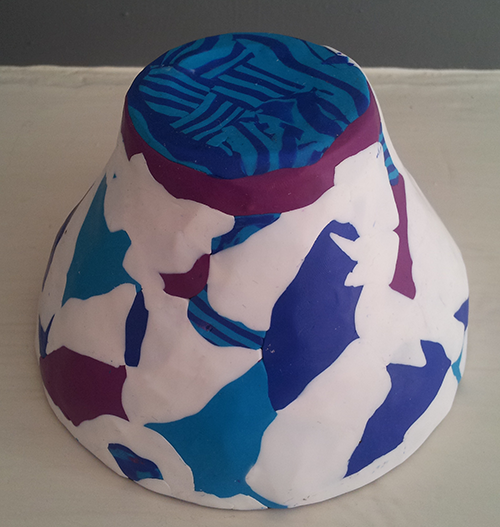 I began to add the clay to the outside of the bowl and I realised that I liked the effect it created on the inside. 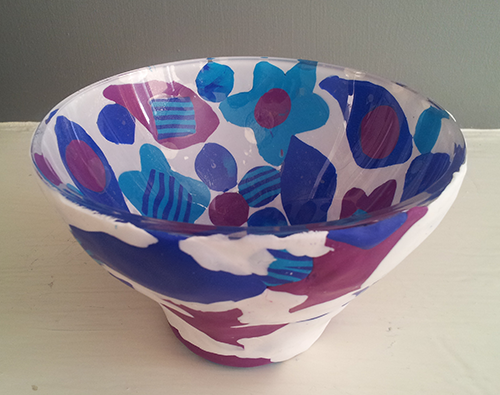 So rather than use the bowl as a mould I decided it would form part of the finished piece. I started to add the colour shapes first, then filled in the gaps with white. As I added the clay to the bowl I noticed it was a little uneven, so I used a rolling pin to flatten the clay, which caused it to squish slightly – another effect I liked. Once the bowl was completely covered I baked it in the oven at 120 degrees celsius for 30 minutes to harden it. One benefit of applying the clay to the outside of the bowl is that it can still be used for foodstuffs (for health reasons it is advised that polymer clay should not touch food). The downside to using a glass bowl is that you need to consider how the clay looks on both sides. It was a bit tricky to get both the ‘front’ and the ‘back’ looking good, but with some trial and error I’m happy with the end result.